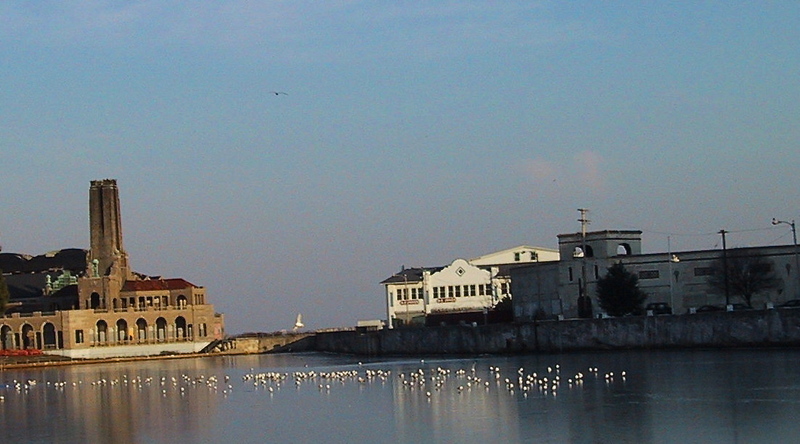 Wesley Lake, looking toward the OG North End: a space where light, breezes and ocean views currently prevail. Paul Goldfinger photo © Click to enlarge. We don’t know where WAVE went. In this three-part series of posts, Blogfinger is reviewing how the process has evolved, so now we present a time-line to document what has happened over the last 10 years, beginning in 2008, with approval by resolution of the North End Redevelopment Plan (NERP) by the Neptune Township Committee. 2011: In June of 2011, three years after the 2008 NERP (“public plan”) was adopted, WAVE and the OGCMA prepare a “private” general development plan to replace the original NERP. This private plan is submitted to the Township. It is titled “North End–a Destination Resort,” and it is not a redevelopment plan. The Neptune Township Committee fails to share this proposal with the public. They also do not reveal the fact that getting involved with this “private” plan would require pulling the plug on the entire 2008 NERP and then starting over. The Township makes no changes to the NERP. 2012: The OGCMA announces that they are ready to break ground at the North End in early 2013, but for what plan? And they have no permits–particularly from the Department of Environmental Protection (DEP). Then comes Sandy on October 29, of 2012. 2013: The OGCMA announces after Sandy that “the developers are going back to the drawing board.” What they fail to announce is that new elevations would be required. But this is nonsense. He is referring basically to the private plan that was prepared four years earlier (see 2011 above,) and the Township Committee already knew all about it. And, by the way, what are the new elevations? No detailed specifications are made available. And no changes can be made to the original 2008 NERP without going back to square one. Actually, the plan is not the mistake—making it public is. The new plan is not approved by the Township. It just floats out of the meeting room and fizzles up into the atmosphere. In Part III, the last part of this series about the Mayor’s Negotiating Team, we will bring you up to date on this subject. 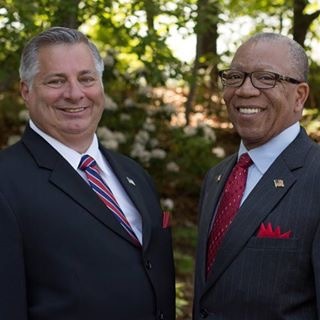 NOTE: According to the Township Clerk, “The Redevelopment Committee” consists of Dr. Michael Brantley, Mayor Nicholas Williams, Land Use Administrator, Township Engineer, Business Administrator, Chief Financial Officer, Township Planner and Redevelopment Attorney. Good Golly Miss Molly: Township Comedy appoints Randy Bishop as Director of Senior Center. Randy Bishop, new Director of the Senior Center. 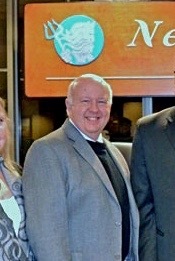 Recently the Township created a furor when they dismissed Brian Batch from the position of Senior Center Director. The firing was, according to the Comedy (aka Committee,) based on an investigative report which has never been released publicly. There was criticism of the process in which the Township brought about the firing, and many seniors are still disgruntled over this issue, considering the procedure to have been problematic. There was speculation that the Township Committee was trying to open up the job in favor of someone else. Mr. Batch hired an attorney because he believes that he should be reappointed to the job. At last night’s Committee meeting, a resolution was passed to offer the position to Randy Bishop who, for years, was a Neptune Committeeman and former mayor. In 2016, he left the Committee to take a job at the County level. We don’t know if he still holds that post, making the new Neptune appointment a second job. 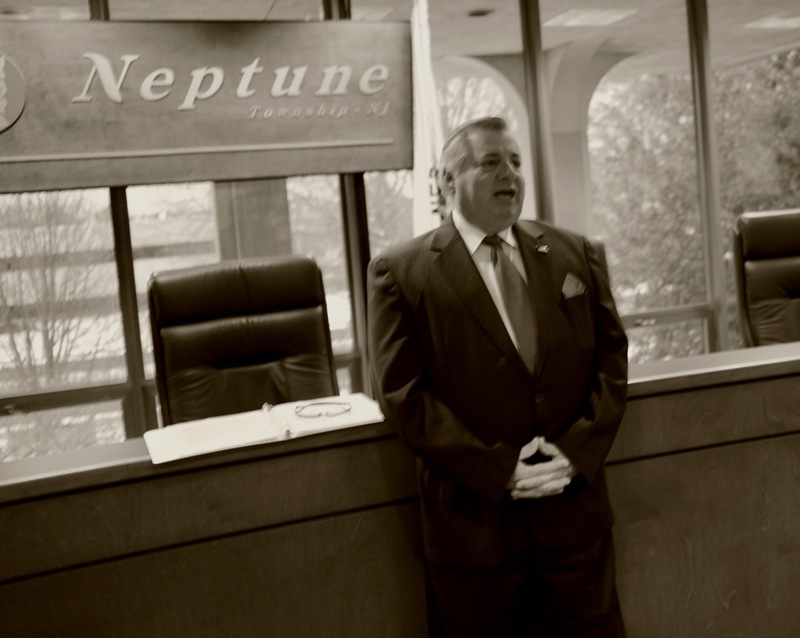 Appointing a former colleague to a lucrative Neptune job will raise eyebrows because of many concerns in the past regarding favoritism by Neptune Township’s one party rulers. Examples of such favoritism include the recent case of the Aurora variance, approvals for developers to build condominiums without parking, and zoning favoritism as occurred with Mary’s Place. Nevertheless, the Senior Center does currently need a Director who also has duties as Director of Senior Services. Bishop was once liaison from the Committee to the Senior Center, so he does have some experience. At last night’s discussion of the resolution to hire Bishop, some seniors went to the mic. during the public portion to once again ask that Brian Batch be reinstated. They thought that making a new appointment now was out of order since the Batch matter is not yet resolved. But the vote for Bishop was unanimous by all 5 Committeemen. “Good golly Miss Molly, sure like to ball. Blogfinger editorial: Will the new Neptune Township Committee try to improve relations with Ocean Grove? Newly-elected Committeeman Nicholas Williams (L) poses with re-elected incumbent Committeeman Dr. Michael Brantley. 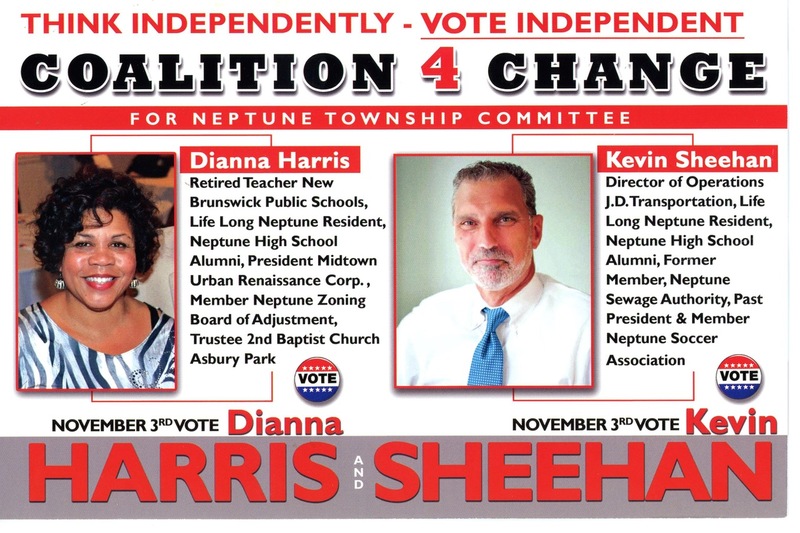 (source: Candidates web site) Williams lives in Neptune, but he is a member of the Ocean Grove Citizens Patrol, so he knows how to spot trouble. We have high hopes for him. Perhaps Dr. Brantley will pay more attention to OG issues in 2016. Internet photo. In a recent Blogfinger poll, 88% of respondents said that they did not trust the Neptune Township Committee to do what is fair and just for Ocean Grove. 310 respondents voted. 85% said No; 9% said Yes; the rest were unsure. 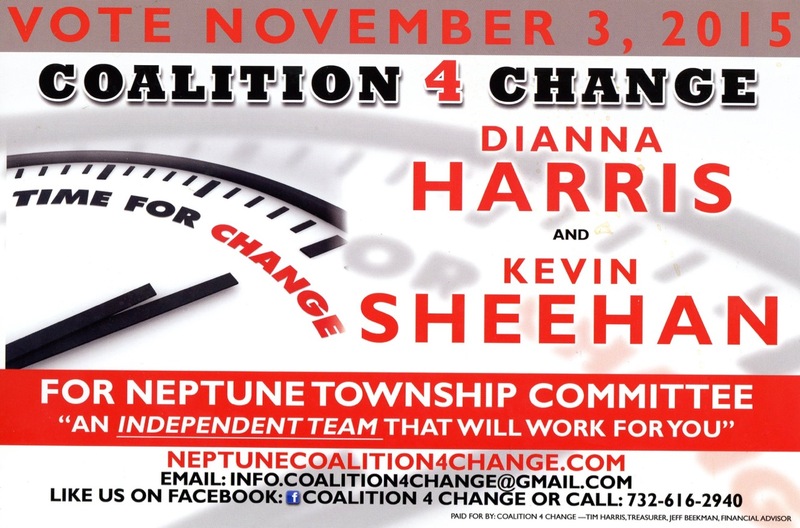 In January there will be a new Neptune Township Committee. Returning are Dr. Michael Brantley (newly re-elected), Kevin McMillan (incumbent and new Mayor) and Randy Bishop (incumbent.) Taking the place of Mary Beth Jahn is Nicholas Williams (newly elected.) We don’t know yet who will take the place of Eric Houghtaling. Mary Beth Jahn was not nominated to run again by the Monmouth County Democrats despite the protests of Randy Bishop. Eric Houghtaling will vacate his seat on January 12, as he will move up to the Assembly in Trenton. Randy Bishop may soon be vacating his seat voluntarily, but there is no official word about that. Hopefully it will be a victory for all of us. At Blogfinger our New Year wish is that the newly reshuffled Committee, headed by a new Mayor, will take a fresh look at the way Ocean Grove citizens have been treated with regards to our historic designations, fair and equal zoning applications, out-of-control property taxes, parking standards, and protection against being overrun by condo-building developers. We have been especially worried about how the North End Redevelopment is being handled. How about zoning all of OG for single family. And how about cancelling the redevelopment zone at the North End. Also, many of us believe that the current application for an RISS exemption in Trenton will jeopardize our town’s future. Why not trash that application to the SIAB and start enforcing the State parking law in the Grove. We want our Committee to represent us in a fair and transparent manner. Hopefully that poll, when repeated in 2016, will show a better relationship between the Committee and Ocean Grove. We also want to remind the Committee that the OGHOA does not represent most Grovers, so the Committee needs to do more outreach in the Grove to judge what our citizens prefer. Don’t wait for the citizens to come to you. Let’s reach out of the box. Neptune Township whitewashes meeting minutes. Mayor Mary Beth Jahn of Neptune Township, New Jersey. I think this version of the event makes Jack look bad without revealing the Mayor’s untoward behavior. Those minutes should include everything that is said at those meetings, not a distorted whitewashed version. This revisionist text makes one wonder what else is distorted when those minutes are typed and does nothing to reassure the public about transparency by the Committee. The Coaster reports on the New North End Redevelopment Plan, but do those Asburians get it right? Wesley Lake, lookng toward the OG North End. A space where light, breezes and ocean views currently prevail. Paul Goldfinger photo © Click to enlarge. At last week’s Neptune Township Committee meeting, April 27, Committeeman Randy Bishop reported that WAVE requested the Committee to amend the North End Redevelopment Plan (NERP. ) However, the Committee took no formal action to amend the plan. As such, the 2008 plan (permitting 165 units) is still in effect. The Coaster reports on the Grove, but they are not from the Grove. Their reporter goes to the Committee meetings, shuffles through the packet of press releases given to him by the Township, and then rolls it out in their next edition, as they did last week, sticking to the Committee’s narrative. The Coaster doesn’t offer any editorial opinions on these matters because they get lots of money from the Township for ads that you can see at the back of every issue; not that there’s anything wrong with that, but The Coaster is busy covering a bunch of towns in this area, so it may not get all the facts straight in Ocean Grove. We, on the other hand, are OG specialists. ——–“Redevelopment of the North End section in historic Ocean Grove will proceed under a revised developer’s agreement.” Wrong! How can an agreement be revised when it has never existed in the first place? That agreement should have happened back in 2008 when the redevelopers were identified, but it never did. ——–“…but an exact timeline for the project has not yet been announced.” No kidding! Such a timeline would be a necessary part of a redevelopers agreement which doesn’t exist, so why would anyone expect a timeline to be announced now? Really? Meetings? 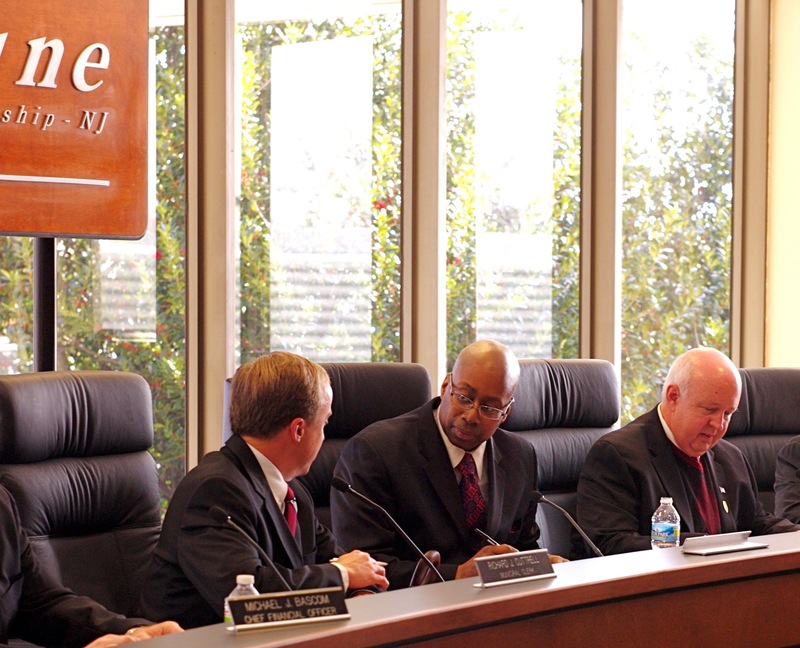 We only know of one such meeting that was announced as occurring in April, and that meeting was attended not by our Mayor (definitely a “principle”) or by the Camp Meeting Association (definitely a “principle.”) Instead that meeting was attended by the Township Engineer, WAVE, Bishop, and the Township lawyer. That meeting was supposed to be about negotiating a redevelopers agreement, but instead it was for WAVE to offer a new plan. If there were “meetings,” then why don’t the citizens know about all of them? ——– “It was very hard and there were very frank discussions. Everyone at the table gave up things to make the plan better.” per Bishop. But who exactly gave things up? Only Bishop and Wave were there. Where was the CMA to say what it would give up? ——-Coaster, “The Ocean Grove Camp Meeting Association…..will still own the land, like it does in all of Ocean Grove.” But, excuse us, the CMA does not own the beach or Wesley Lake, and those places are involved in the New NERP. Sorry, but the timeline must be included in the Redeveloper’s Agreement before it is signed. And let’s be frank here: those WAVE “principles” have been concealed from the public for the last 8 years. Why weren’t they identified before? They will have to come out of the shadows now if they own over 10% interest in the project. ——-And Coaster what about the site plan which must be designed after the surveys are complete, and no surveys have evidently been done so far. Those site plans are needed to get all necessary approvals such as DEP, Army Corps of Engineers, etc. ——-And Coaster how about the Gateway Design feature* which has now been eliminated? Why did that happen and why did you forget to tell us about the construction plans which must be obtained before this New NERP goes forward? It seems that you only want to mention what they tell you to mention. Tsk, tsk, tsk. 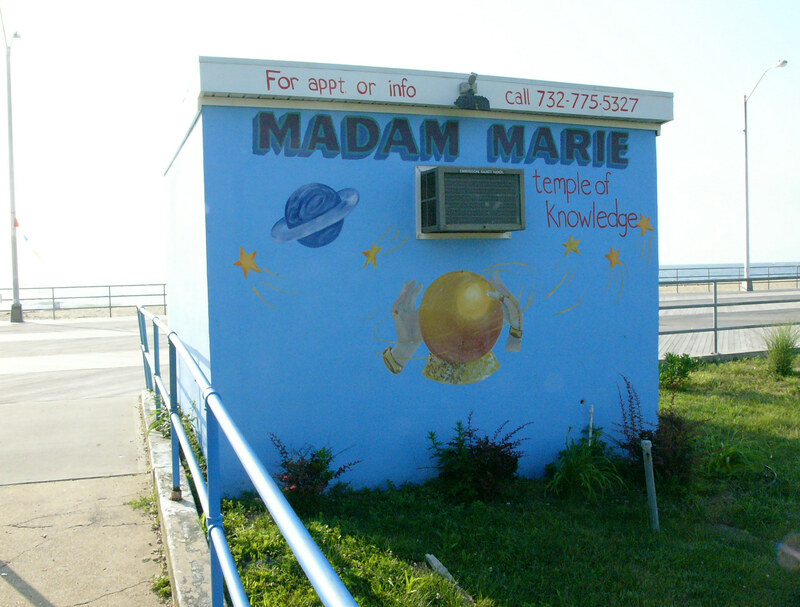 * Gateway design feature: A statue or other structure on the boardwalk at the place where Asbury Park meets Ocean Grove. BIG BIRD: What the heck avenue do those NEW NERP words mean?